We waited long enough for its arrival and now that it’s here, let’s hope the snow is here to stay — at least for a while! Unfortunately, up-and-down temperatures along with freeze and thaw tendencies of our recent winters seem to leave us with sheets of ice hiding between layers of snow. The slush that comes along with intermittent rain freezes into thick, icy mounds making walkways challenging to navigate and some roads, sidewalks, and driveways deceptively slippery. Salt accumulates on roads and in snow banks and is then washed into storm drains during thaws. Responsible spreading of salt by homeowners can reduce the amount of salt washed into storm drains and into our waterways. Salt impacts your gardens too. It can raise the pH of your soil and make it less fertile. 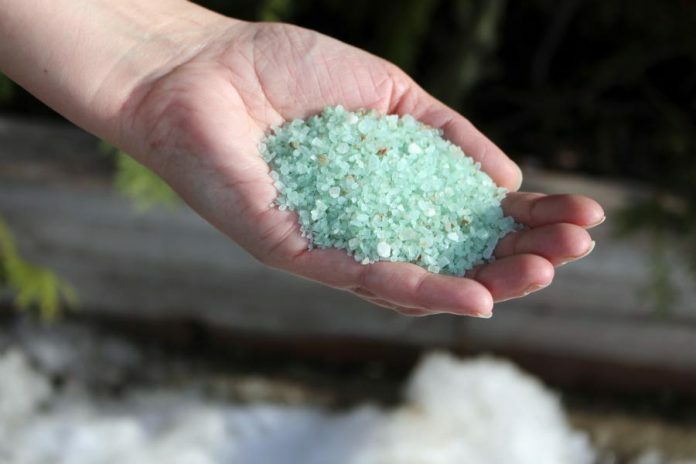 The health of trees, shrubs, grasses, and plants that line salted driveways and walkways can deteriorate if the concentration of salt becomes too high. Root systems are easily damaged by salt, making uptake of water difficult for plants. The drought-like conditions created by excess salt causes plants to dry out. The salt we use for roads and sidewalks is rock salt (halite), the same as table salt but unpurified. It works by a process called freezing point depression that lowers the normal freezing point of water, melting ice and preventing water from refreezing. For salt to do its job, there has to be some existing water on the surface, so sometimes a brine solution is used. If the temperature is lower than around -10° C, road salt won’t have any melting effect. Often a mixture of salt and sand (called pickle) is applied to roads. Some cities, including Calgary and Edmonton, also use a calcium chloride solution for de-icing roads; it works in lower temperatures, but is even more corrosive than sodium chloride. Other cities, including Toronto and several in Quebec, use a solution of salt and sugar beet juice to reduce the concentration of salt and increase its effectiveness at lower temperatures. Spreading sidewalk salt can have a negative effect on your property, but it is also important to recognize that the impacts extend beyond your yard. Salt dissolves in water, which means that it is easily carried into groundwater. 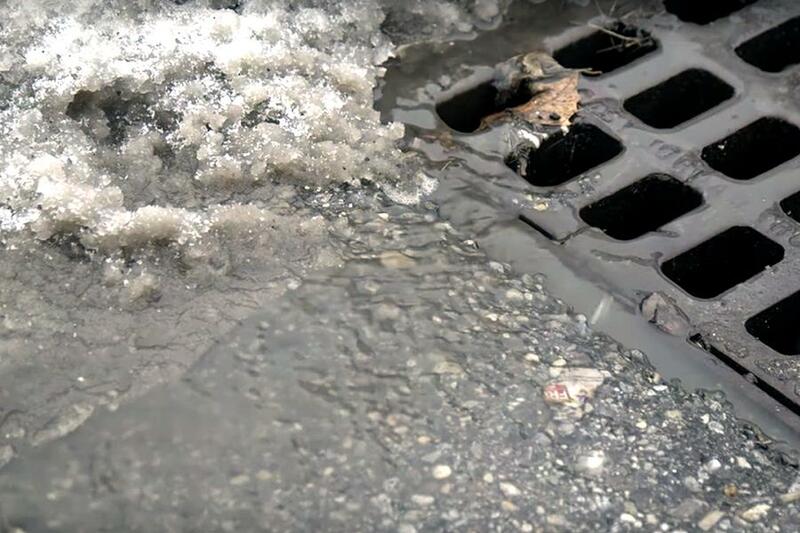 Once the spring thaw and April showers hit, salt runs off into storm sewers increasing concentration in our waterways, and affecting plants and animals in our rivers, streams, and lakes. 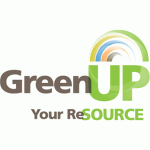 “The increased salinization of freshwater waterways is a growing concern for many areas of Ontario,” explains Heather Ray, GreenUP’s manager of water programs. “Salt interacts with the bonds between heavy metals and sediments, which can increase harm to aquatic species. Salt can block the movement of oxygen into deeper, cooler water, impacting aquatic species such as lake trout. According to Back to Basics: Clean Water, a recent report by the Environmental Commissioner of Ontario, Back to Basics: Clean Water,” in 2017 the Town of Simcoe experienced high salt levels in the town’s drinking water, which resulted in the Haldimand-Norfolk health officer to issue a “do not consume” warning for people with high blood pressure and sodium-restricted diets. 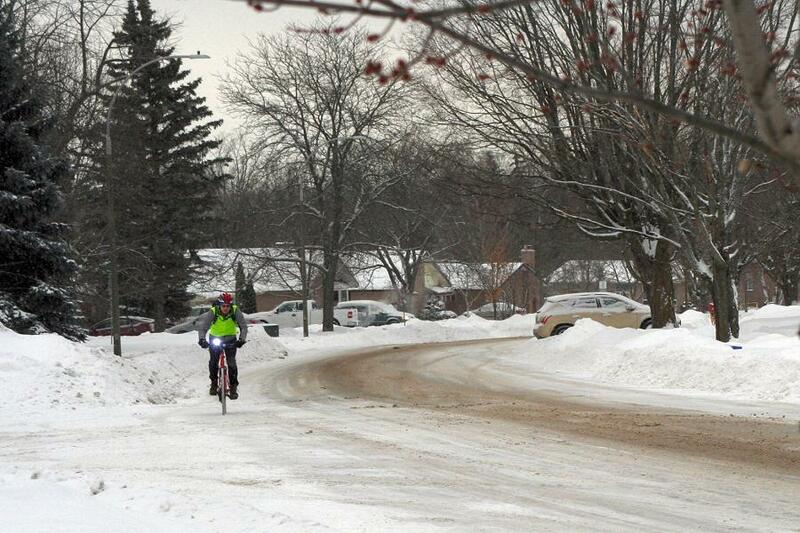 It’s very concerning to think that all the road salt use throughout the season could cause such a drastic impact. In the City of Peterborough, straight salt is used on all arterial and collector streets only when weather conditions and temperatures allow for its use, and a mix of sand and salt is used on all of our residential streets. “The responsible use of salt lays within the hands of all that use it,” says Brian Jobbit, the City of Peterborough’s manager of public works. 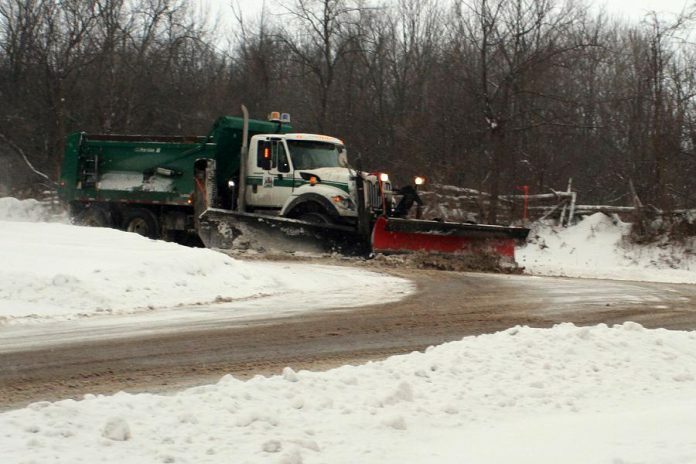 “Our fleet of trucks is equipped with plows and material spreaders that are all computer-controlled for application rates based on the material being spread. There are many products on the market that work much like salt, but without the environmental impacts. On a large scale, many municipalities are opting for salt alternatives when de-icing roadways. 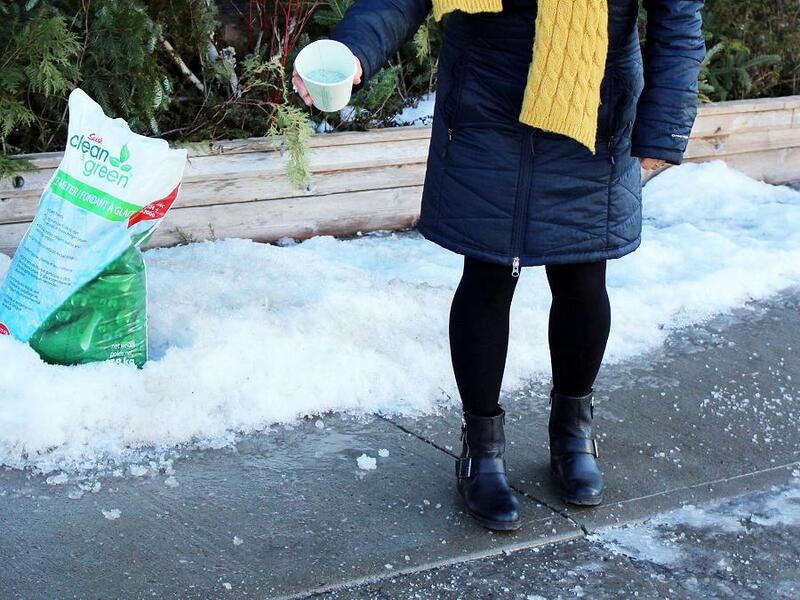 Several cities in Quebec use an organic spray made from sugar beets to remove ice from roads. For years, Toronto has also used the same beet mixture to de-ice roads. The solution is more expensive but it has less impact on the environment and is used when temperatures dip below the point of salt’s effectiveness, which is at -10° C; the beet solution works to -32° C.
For around your home, there are many alternatives to salt that can help to improve slippery conditions. Sand is a common alternative that creates traction in icy areas. Non-clumping kitty litter and fireplace ashes are also great substitutes. Just be sure not to track them indoors where they can make a mess. The GreenUP Store (378 Aylmer St. N., Peterborough) carries a product called Clean and Green Ice Melter by Swish that is gentle on vegetation, concrete, water, and floors. It is not corrosive and is completely safe to handle with bare hands, so it’s safer around children and pets, too. This product continues to melt ice below -22° C, so it has the capacity to work at the cold temperatures we experience in the Kawarthas, and beyond the effectiveness of salt. Enjoy the beauty of winter and whether you’re on the road, the trail, the sidewalk, or the front stoop, slow down and take time to consider the best solutions for winter snow and ice removal that safeguard our gardens, help wildlife, and protect our water.